Ace Energy deliver around Halifax, Huddersfield, Bradford, Leeds, Oldham and the surrounding areas within a 30mile radius. We are now able to offer a national service of bulk products for trade and personal use please contact us on 01422 310121 for details. 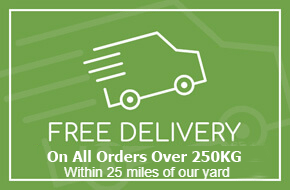 Any delivery fee quoted is per pallet not necessarily per order, please phone for details.